Barkow Consulting recently published a great List of Power DACH Fintech Women and ranked them by Twitter Followers. We took all this names and ranked them now by Klout Score, as we believe its a better ranking method than simple by followers. 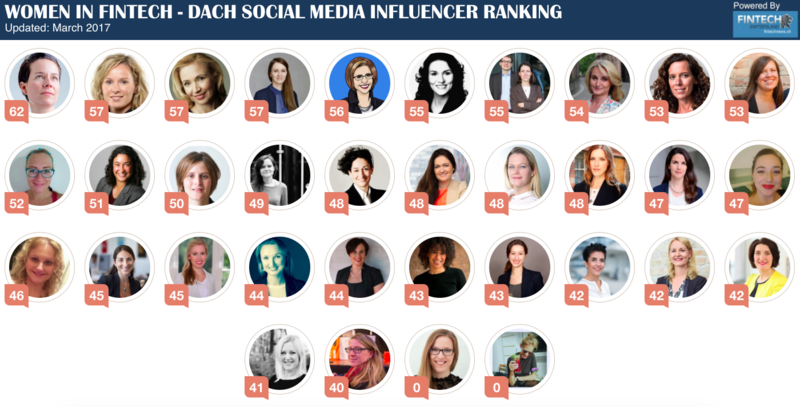 Also for us this list was a great resource as we publish monthly our Swiss , DACH and German Fintech Influencer Social Media Rankings, therefore we can double check if we do not miss any important DACH fintech women out there. The Klout Score measures the influence on various social media channels such as Twitter, Facebook or Linkedin. The score goes from 1 to 100. We will update this new list monthly on this page. Send us please a message if you think we missed you in this list. Founding partner Daily Fintech Advisers. Neugierig, liberal, digital-affin, food-loving. Wohnhaft in Mitte. Unternehmensberaterin.